Francesco Molinari, the reigning Open and Race to Dubai Champion, has been named the 2018 Hilton European Tour Golfer of the Year, winning the prestigious annual award for the first time. A panel comprising members of the golfing media chose Molinari to be the recipient of the distinguished prize following a magnificent 12 months on the European Tour in which he secured a first Rolex Series title in the BMW PGA Championship, a maiden Major victory at The 147th Open Championship and played a starring role in Europe’s Ryder Cup win in France. Molinari’s first triumph of a memorable 2018 came at Wentworth Club where he finished two shots clear of Rory McIlroy to win the BMW PGA Championship, having finished runner-up in the event 12 months previously. He came close to adding another Rolex Series victory the following week by carding rounds 66-66-66-65 to finish runner-up to his Ryder Cup teammate Thorbjørn Olesen in the Italian Open in his homeland. The 36 year old’s standout performance in 2018 would come in July, though, where, playing alongside 14-time Major Champion Tiger Woods, he held his nerve in tricky conditions at Carnoustie by carding a bogey-free final round of 69 to lift the Claret Jug and become the first Italian to win one of golf’s four Major Championships. He followed that with another top ten finish in August at the US PGA Championship, before creating more history in The Ryder Cup the following month, forming a memorable partnership with Tommy Fleetwood en route to becoming the first European to win all five points from his five matches against the United States. Fittingly, it was also Molinari’s victory over Phil Mickelson in the Sunday Singles at Le Golf National which reclaimed The Ryder Cup for Europe. Molinari then rounded off a remarkable year by becoming the first Italian to win the Race to Dubai Rankings presented by Rolex, holding off Masters Champion Patrick Reed and 2017 Race to Dubai Champion Fleetwood to finish the year as the European Tour’s Number One. 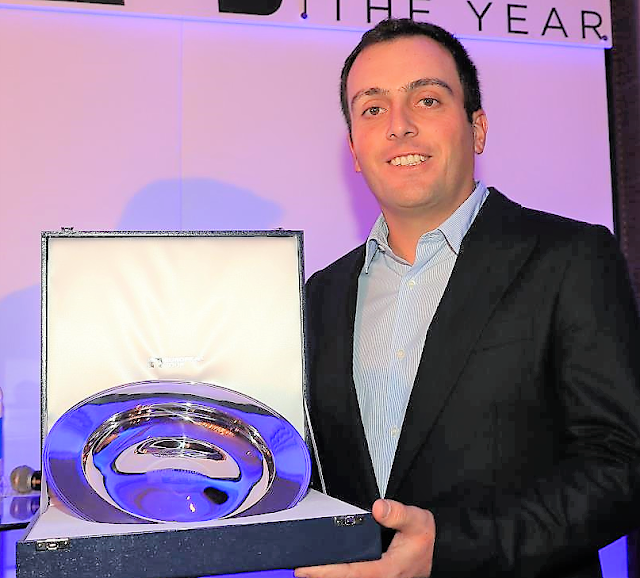 “It is a huge honour to be named the Hilton European Tour Golfer of the Year,” said Molinari, who received the award today (Monday) at the London Hilton on Park Lane. “So many great names have earned this honour and I feel very proud to join them. “It is an award that means a lot to me and is a nice way to end a very special year. Winning at Wentworth, in one of our biggest events, gave me a lot of confidence for the summer, but obviously winning The Open at Carnoustie, becoming my country’s first Major Champion, was incredible. Keith Pelley, Chief Executive Officer of the European Tour, said: “There is so much to celebrate after another fantastic season on the European Tour which saw so many of our Members excel on the global stage and 12 in particular during a spectacular Ryder Cup in France. “But it is right that we pay special tribute to Francesco Molinari who repeatedly made history this year. Iain Carter, BBC Golf Correspondent, who was part of the panel, said: “The list of monthly winners and nominees for this year’s award shows the depth in talent and nationalities on the European Tour. Matt Wallace made a compelling argument with three victories and Patrick Reed also merited massive consideration after winning the Masters, but Francesco Molinari’s story in 2018 was absolutely outstanding. “To win at Wentworth, then lift the Claret Jug at Carnoustie, and then back that up by winning five points at The Ryder Cup and win the Race to Dubai is up there as one of the great years in European golf. Fellow panelist Nick Dougherty, Sky Sports Golf Presenter, said: “There were many stand-out performances on the European Tour in 2018, including Oli Fisher’s historic 59, Tommy Fleetwood’s 63 in the final round of the US Open and Matt Wallace’s victory in Denmark when trying to earn a Ryder Cup wildcard. “But they all pale into insignificance compared to Francesco’s performance under pressure at Carnoustie. That felt special, particularly his putt on the 18th when you look at who he was playing with. “He also won at Wentworth, which is massive when you look at the list of previous winners there, and then he produced that performance at Le Golf National.